Sunday I had the privilege of hosting some lovely ladies from the next town north at my home for a Close To My Heart gathering. They were very excited to come to my house instead of me going to theirs, and I loved that I could show them more things since I didn't have to travel! 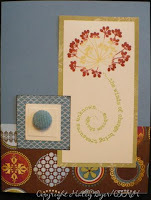 We began our class with the card at right which uses the Everyday Celebration card kit. 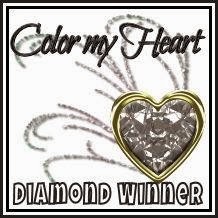 Today is the last day you can purchase this kit or earn it for free!!! 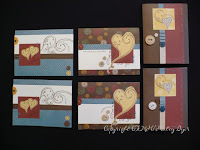 We used the Grace paper pack, with Honey, Cocoa, Twilight, and Barn Red inks. A little Colonial White crocheted ribbon and gold brads finished it off. This card is based on the Wishes "All Squared Up" sketch. Our second card showcases the September stamp of the month, Treasures. 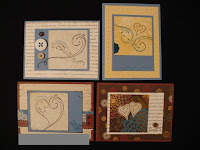 Today is also the last day to purchase this stamp set or earn it at a discount or even free. We used the Emporium paper pack and practiced the Rock 'N Roll technique with Buttercup and Vineyard Berry inks. This card is loosely based on the "Medallion" sketch from Wishes. 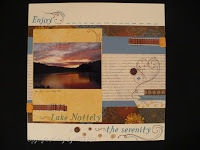 Laurie Flannery also greatly inspired this card. Go check out her lovely work when you have a chance. 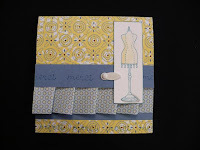 Our final card was many of the ladies' favorite due to its elegant simplicity. 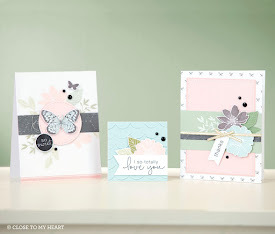 It also features Treasures, the September stamp of the month, but this time we paired it with the Sweet Home paper pack in White Daisy, Garnety, Heavenly Blue, and Indian Corn Blue. 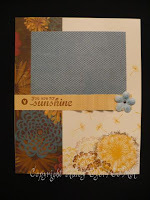 Can you see the Heavenly Blue sponged on the edges of the White Daisy cardstock? We tried two new techniques to glam this card up, both using Liquid Glass and Prisma Glitter (You'll see more of that tomorrow so stop back by!). 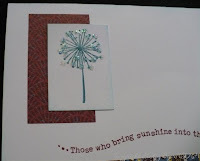 First, we dotted Liquid Glass on the dandelion seed the sprinkled the Prisma Glitter on it. Hopefully ou can see it in the close up picture below. Now, check out that Bigger Brad on the B&T patterned paper strip. Does it sparkle or what? I held the brad with tweezers, poured some Liquid Glass onto its head, then dipped it into the jar of Prisma Glitter. It is oh-so-pretty in person! (To let the brads dry, I turned a styrofoam egg carton upside and pierced the brads into the cups. Note to self if you try this one at home: pierce the egg carton before you "bling" the brads because it is hard to push the wet, tacky brad into the carton unless you've prepunched the hole! And by tacky I mean wet glue, not gaudy! These little babies are purty!!!) You may have to click on that full-card picture above to see the brad better. Once again, I have to thank another incredibly talented CTMH consultant, Jody Gustafson, for the inspiration for this card. 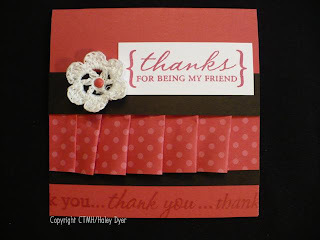 So, here's a big thank you to my crafting muses and to the ladies who made the trek down for a little stamping time. 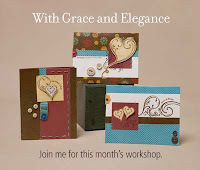 Saturday, a few friends and I created the Grace workshop I had advertised earlier in the month. (My last two posts were the layouts from the workshop.) 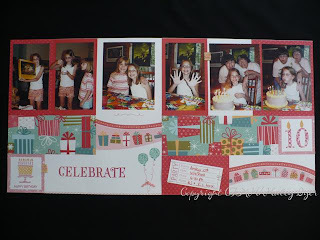 We had a great time chatting, stamping, scrapping, and card making! We got sooooo much done! Joy was so clever! 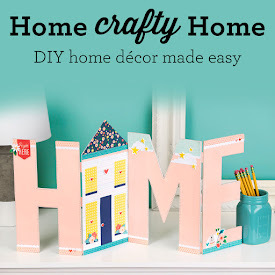 She created this adorable faux edge anchor by using a small rectangle of Barn Red card stock (AKA scrap destined for the trash), added two brads, and created a cute embellishment. I love it! If you give this new technique a try, be sure to leave a comment linking your creation so we can check it out. 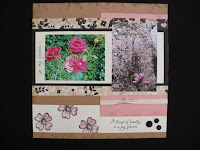 Very cool use of scraps! Thanks, Joy! 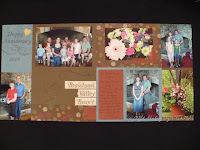 This is the 2nd layout we created at the Grace workshop yesterday. My parents' anniversary is 7/6 and ours is 7/8 (yes, I planned it that way) so here are our celebrations this year: two luncheons within two days at the same yummy place! The first one was with my family for my parents' anniversary, and the second was with DH's family for ours. 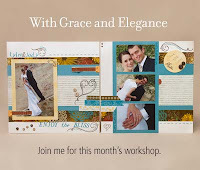 You may remember this layout from my post about my Grace workshop (which is being held this afternoon, by the way). I got my pictures developed and put on the layout so I thought that you might like to see the finished project. If you'd like to read more about the materials, etc., just click right here. My Car is Fixed and It's FRIDAY!!!! We have been a one-vehicle family for the past several weeks, and though we've enjoyed some family bonding ("Are we there yet?" "Don't forget to pick me up at..." "What time do you need to be there? "), my car is now fixed. Hallelujah! I should have blogged about it stranding me on the hill going up to school/work. Read on if you want to hear THAT story! It turns out it's not a fuse but the accelerator pedal. The entire thing. That's why I had power but couldn't "rev" the engine. Turns out this is an electronic sensor problem and the entire pedal system will need to be replaced. The better news? Ford will *maybe* release about 500 of these things from the factory on 9/9. I might be customer #501 and seriously out of luck. Fortunately, you already know this tale has a happy ending. The part arrived yesterday (only two weeks after it was "released") and $300 later I have a shiny new accelerator pedal. Too bad the brake pedal is looking so shabby... I guess I'll drive it some more anyway. Fortunately we (really I mean DH) pulled the jet ski out of the water before we got all the torrential rain! These pictures are actually from the summer of 2005 when we first bought our jet ski. Before then we enjoyed Grumps' and Uncle Reid's and finally decided it would be a great investment in our family. This layout is another one I pulled out of my stash (also made at the Atlanta Regionals in '08) and matched up with a selection of photos. 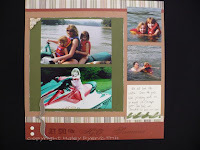 Generally when I scrapbook I start with the pictures, but sometimes the layout gets created first and I find pictures to match. (I am amazed sometimes at how well I can "make" photos work with layouts from classes, etc. Get 'er done!!!) It's going in the "Things We Do" album, which has taken away my guilt about trying to make sure that the girls' albums get filled. I still do layouts for them, but some things have to go in the family albums. They can fight over them when I'm gone! We are so thankful for the rain that we've received but were thrilled to get some sunshine yesterday! The news coming out of Atlanta is so sad but we're fortunately up in the mountains on higher ground. Now on to the layout: I've actually had this one for a long time. We created it at the Close To My Heart Atlanta Regional Celebration in '08, and I'm finally getting around to putting some pictures on it. 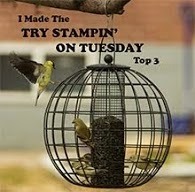 I'm using it as the title page of my "teaching album." 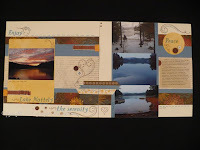 This layout is based on the Reflections sketch, "Bottom Border- Title." I love how we accented the Silhouette paper pack, which is very neutral in Colonial White, White Daisy, Bamboo, and Black, with a Desert Sand background and Blush accents. 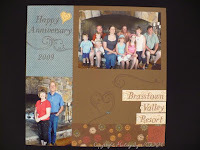 We did a ton of direct-to-paper distressing and used the stamp set Joy Forever for the flowers and sentiment. Finally, the accents include Colonial White twill and a trio of black buttons. The flower photos are from my yard. I love flowers! Need an Inexpensive Christmas Gift? 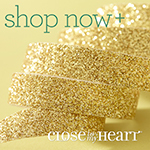 It's not too early to begin thinking about your Christmas shopping! 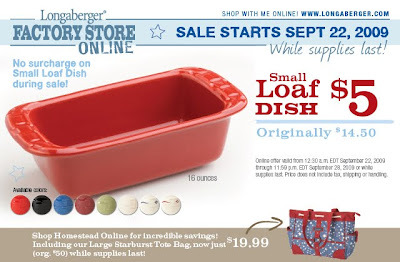 Can you imagine this beautiful loaf pan filled with fresh bread, just in time for the holidays? My Mom's Cranberry Nut Bread is divine! Wouldn't these make the sweetest teacher gifts? (I would love one!) Or what about the hostesses of those fabulous holiday parties? Whether you fill them with goodies or wrap them with a pretty bow, these loaf pans are sure to be appreciated. You can shop directly on my site by clicking HERE and then selecting "Click here to shop homestead and factory store online" on the left bar. Scrumptious! It's been a few weeks now, but I was so surprised and delighted to receive a bit of "contraband" from two dear friends! Those that know me well know that I speak French (majored in it in college), used to be a French teacher, and love most everything French. 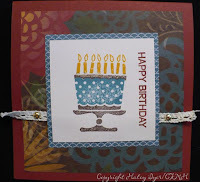 You can imagine my delight when my friend & DL Debora surprised me with the "Chic Boutique" stamp set from Stampin' Up! Here are a few things that I made with this adorable set. She said that this was her favorite image of the set so this is the merci card I made her. That same week my friend Joy also gave me an adorable set of Stampendous clear stamps called "Amore Brackets." 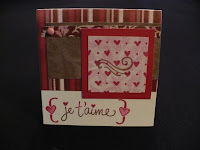 I made this little je t'aime card with the set for my hubby. Merci beaucoup, mes cheres amies! Je vous aime! 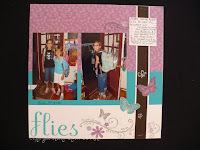 The Pink Elephant's "Back to School" challenge #32 was just the impetus I needed to scrapbook this year's photos of the first day of school. 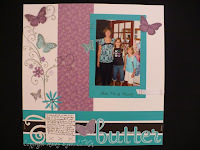 The butterflies on Ansley's shirt and in her tummy (plus an idea from Creating Keepsakes magazine) inspired this creation, as did the layout on p. 77 of the new Close To My Heart Autumn/Winter 2009 Idea Book. That layout and my sketch are based on the Cherish "Simple Contrast" pattern. (Are you singing or at least humming along?) 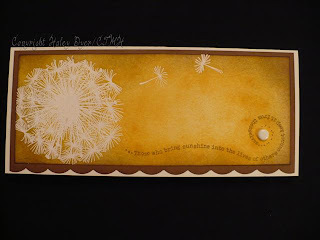 I love that the September stamp of the month has the phrase "you are my sunshine!" DH tells me that often, so I decided that turn about was fair play. I am sooo thankful for my family!!! It is really rainy here so I sat down for a little sunny creating time. This idea has been rolling around in my head for a while. 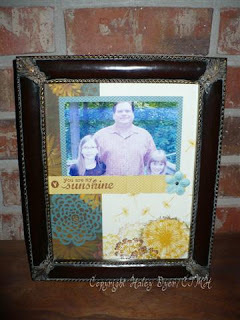 I love that I can personalize my home with my stamping and scrapbooking supplies! We will be making this at Jen's gathering Sunday, so if you're in the neighborhood and want to attend, please let me know. We'd love to have you. 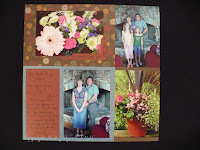 This layout was made to go in an 8"x10" frame. 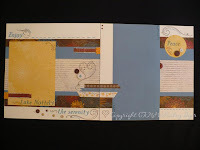 I used a piece of Colonial White card stock as my base, then embellished it with the Grace papers and the September stamp of the month, Treasures. The design is based loosely on the Reflections sketch "Main Frame- Back Drop." (Sorry for the poor photo quality! I just printed out this family picture quickly on my printer so you'd get the idea. Then, it turns out it's hard to photograph a picture frame due to the glare.) Also, I hope you're not sick of those pleats yet! I hope your day is full of sunlight and laughter, no matter the weather! 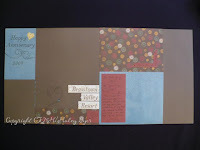 I used my Tombow tape runner for the adhesive strip. 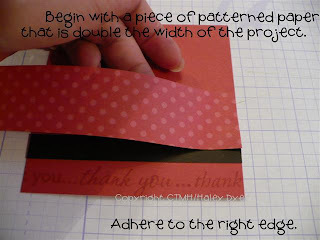 The paper you're going to pleat should be about double the width of your project. Mine measures 1.25"x8". 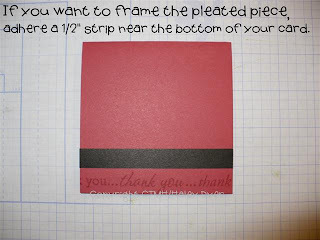 The black cardstock strip across the top of the pleats (to hide my messiness) measures 3/4"x4". 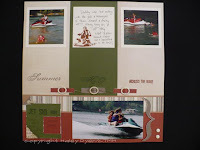 Here is my finished card again. Give this fun (and easy) technique a try! 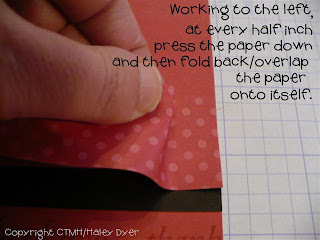 It may help to practice first with some scrap paper, but it really isn't difficult. If you get creative, post a pleated paper project somewhere online, and leave a link in the comment section so that we can all "ooh and ahh" over your creation! Happy Grandparents' Day (yesterday)! The occasion snuck up on me, so yesterday morning before church I whipped out a pair of these cards. They were so much fun to make! When I saw this week's sketch over at Card Positioning Systems, I had to give it a try. I used several of my Word Puzzle sets for all the images on the card. (I cannot believe that they are being retired! Should have known that would happen since I now have all 12 of them! Seriously, they are the most awesome set of monthly stamps ever.) 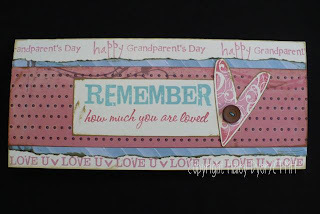 "Happy" came from the March set, "Grandparent's Day" and the focal sentiment are from the September set, and the heart and "Love U" border are from the February set. My color palette came from the Notebook collection: Colonial White cardstock, Blush, Hollyhock, and Crystal Blue ink for the stamping, and Bamboo and Desert Sand for the distressing. Have I told you how much I love our new buttons?!? Not as much as I love the girls' grandparents, but still! We love you, Grammie & Grumps and BJ! BTW, this card measures 8"x3.5", which makes it perfect to mail in a business envelope. It's sometimes hard in my bitty town to find envelopes in the size you need (though now that Wal-Mart has arrived I guess it won't be the problem it used to be). 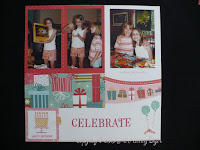 These photos from Ansley's 10th birthday always make me smile! The one of the two girls is one of my favorites, and the two of her blowing out the candles are just precious! Check out her Grandmother in the background. I'm not sure who was having more fun! My layout is based on the Rhapsody sketch from Wishes. The cake, sentiment, and balloons are all from the Everyday Celebration card kit stamp set (available only through the end of the month). Can you see the prisma glitter on the candle flames? 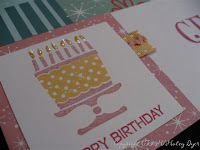 I also used the Celebrate sentiment from my Cupcake Sprinkles stamp set and the invitation stamp from my Party Invitation stamp set. I love making these "birthday candles." 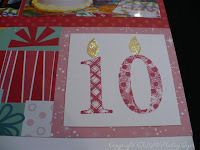 I used my Boutique Numbers stamp set and then the "flame" is a petal stamp from the Friendship Blessings set. The flames also have a touch of prisma glitter for extra sparkle. These are so much fun on kids' birthday cards! 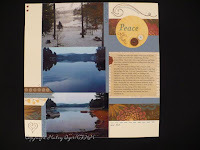 The layout & cards at left can be found on p. 8 of the new Autumn/Winter '09 Idea Book. 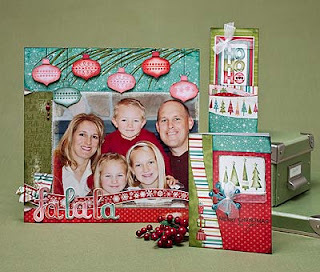 The Jingle paper pack that I used is this year's must-have holiday paper pack! 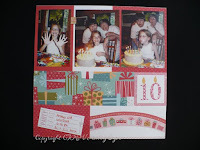 For the birthday layout, I just used papers that were festive without screaming Christmas or winter. The colors I used are Tulip, Creme Brulee, and Blush. I also pulled out a little Blush and Creme Brulee ribbon for accents. It's official! 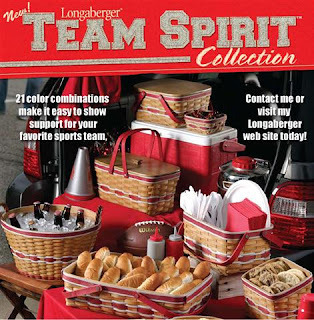 Longaberger now carries Team Spirit baskets for ALL 32 NFL teams, complete with the official NFL team logos! Go, team, go! We are adding college teams often, so ask me about your favorite. I'm hoping that we add the Georgia Bulldogs soon since my mother-in-law is a big fan. Don't worry, Dad, they're not MY favorite! ;) I can already get the Bulldogs' black & red combo, but I'm holding out a bit longer for the team logo too. We also carry 21 color combos for your local sports teams. 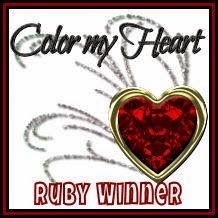 Contact me about your school colors. Wouldn't a basket sale make a great team fundraiser? 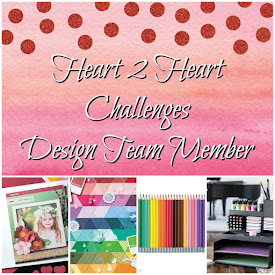 I would be happy to work with you to help raise money for your team. 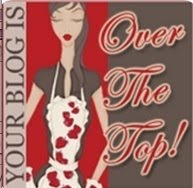 I am so excited about this month's workshop! 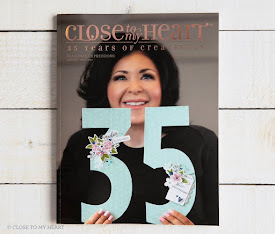 Whether you're a scrapbooker or a cardmaker (or both), there's something for you! Next is my set of six cards. By now, I'm sure that you're awed, amazed, and wondering how I was able to create all this. First, I have to thank Close To My Heart for designing this beautiful workshop. They are truly making my creative process (and yours) faster, simpler, easier. If you'd like to learn more, just click HERE. Thanks! 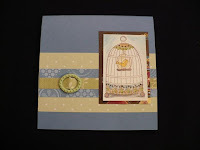 My card features the September stamp of the month, Treasures. I've seen cards similar to this on several blogs, and I fell in love with the beauty of its simplicity. 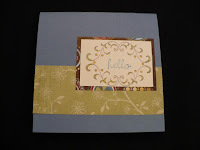 To meet the color challenge, I began with a Colonial White 8"x3.5" top-fold card base. On the 7.5"x3" Colonial White main panel, I heat embossed the flower image and seeds with white embossing powder, then stamped the saying in Chocolate. 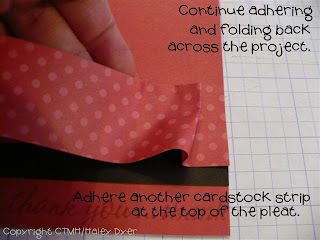 I sponged Honey across the card panel, keeping the center lighter. 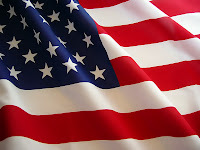 (Wipe off the embossed image with a kleenex to remove the colored ink it resists.) 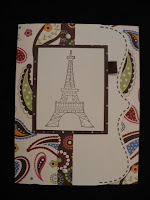 I sponged the edges with Desert Sand to give the card depth and finished the edges by distressing with Chocolate. A Colonial White Bigger Brad gave this simple card just a touch of dimension. I mounted the main panel on a piece of Chocolate cardstock after I used my corner rounder (w/o the guard) to created the scalloped border. (All materials from Close To My Heart.) Thanks for looking!